Choosing a random restaurant as you drive aimlessly through your city? Do you search online via Google, Yelp, Bing, etc.? If you are like us, you would skew heavily on the word-of-mouth referrals and online search. To be frank, word-of-mouth referrals really do trump all recommendations because we trust our friends and family. So much so that studies have shown that we are 71% more likely to purchase a product/service if said product/service was recommended through social media, which is largely comprised of our friends and family (Hubspot). But what happens when that well of information dries up? We turn to the internet. So how does finding a new restaurant have to do with growing your law firm clientele? The main takeaway is that the process of finding a new restaurant is almost identical to the process of finding a law firm for their services. When people use the internet to find a local product or service, we typically use the same search conventions on search engines. In our case, we tend to type in exactly what we are looking for with the inclusion of a geographical marker. So when searching for local law firms, a searcher looking for a Law Firm in Denver, CO will likely type in “Denver Law Firms” or some variation of it into the search engine. 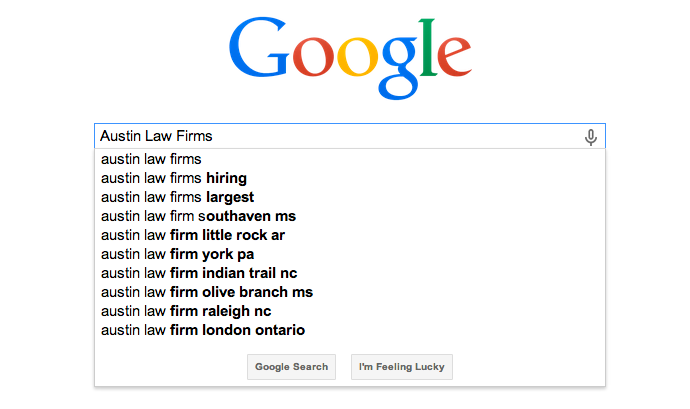 If any of those law firms were optimized for Local SEO, there’s a good chance they will be found. If not, they will have a hard time attracting new clients. If that wasn’t enough, Google has built in localization into its search algorithm which creates personalized search results for its users when they are logged in. So that means, sometimes you don’t even need to add a geographical marker in order to find a Denver Law Firm when you’re near Denver while conducting your search. You can simply type in “Law Firm”, and if that Denver-based law firm is optimized for Local SEO, you would find it. According to comScore, 12.8 billion desktop searches were conducted in June 2013 using Google sites. Of those 12.8 billion searches, 20% were related to location. That means, 2.56 billion desktop searches had a local intent according to Search Engine Land. In addition, mobile local intent searches are currently surging. With more and more people owning smartphones every year, eventually mobile local-intent searches will surpass desktop local intent searches. In fact leading analytics at BIA/Kelsey predict this will occur in 2015. Now knowing that this many people search online for local services and goods, is your law firm fully optimized to capture the local traffic targeting your practice’s services? If you meet all the criteria above, then you are ready go. You’ll need to claim your company’s profiles, get company citations, remove any duplicate listings that may exist on the internet, and build out your company’s local profiles at prominent sites around the web among other things. 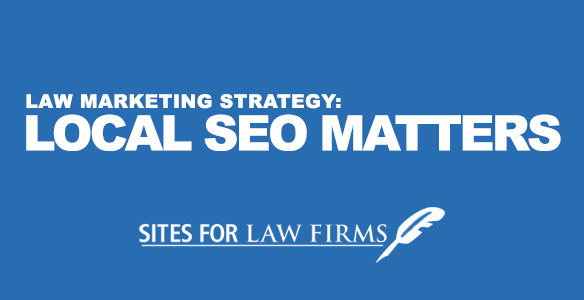 The Local SEO process is very important for your law firm’s success. There are many guides online that may assist you on your way, however, it may be in your best interest to hire a law marketing professional. At Sites For Law Firms, we have created a law firm-specific website platform built on the foundation of solid SEO. We understand the industry and provide legal marketing services to ensure your practice has the best possible exposure in your area. Contact us and see how we can grow your firm today. This entry was posted in Lawyer Websites by CEO, Sites For Law Firms. Bookmark the permalink.